HEAD of State Tun Pehin Sri Abdul Taib Mahmud (right) handing over Excellent STPM Student Award to Abdul Ilyasa’ Bin Azman at the State-Level Maal Hijrah celebration 1440H/2018 held at Sibu Islamic Complex yesterday. SIBU: The Maal Hijrah Special Model (Tokoh Khas) Award was given to Tan Sri Datuk Amar Haji Bujang Mohd Nor in conjunction with State-Level Maal Hijrah celebration 1440H/2018 held at Sibu Islamic Complex yesterday. Repsented by his son, Bujang received RM30, 000 cash, a plaque and certificate from Head of State Tun Pehin Sri Haji Abdul Taib Mahmud. 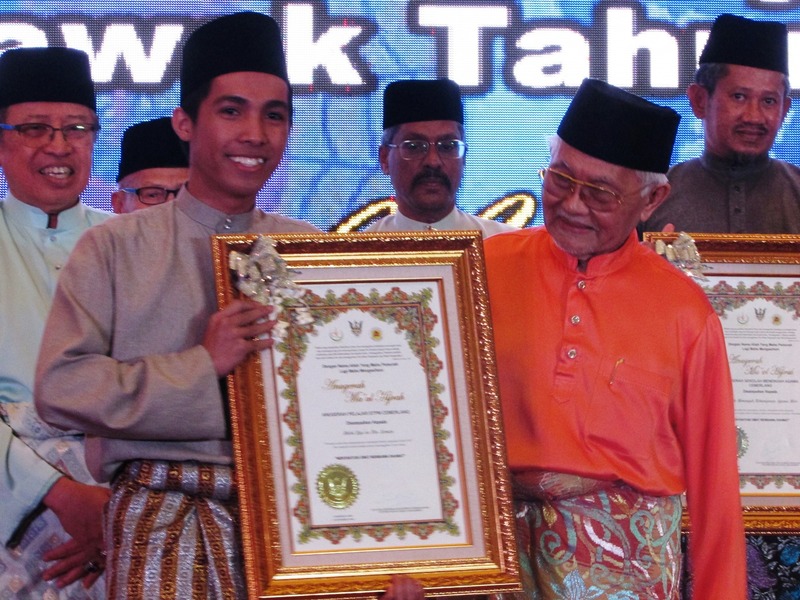 Twelve others received the ‘Tokoh’ Maal Hijrah (Maal Hijrah Model) awards at the same function. They received the awards from Tun Pehin Sri Taib. Meanwhile, the Organisational Leadership Award for Islamic Agencies was awarded to Datu Haji Abang Mohd Sibli Bin Haji Abang Mohd Nailie whereas the Research & Development Achievement Award went to Haji Syahrul Nizam Bin Junaini. Each of them received RM10, 000, plaque and certificate. Excellent Family Special Award was given to the family of Datu Hj Mohamed Ali Bin Hj A.Mohd Sheriff while the Islamic Officer Award was conferred on Datuk Hj Abdul Wahap Bin Hj Abang Julai whereas the Non-Muslim Officer Award went to Dato James Chan Khay Syn. Each of them received cash of RM5, 000 plus plaque and certificate. Best Mosque Management & Administration Award was given to Masjid At-Taqwa Kampung Pinang Jawa, Kuching that came with a cash prize of RM5, 000, plaque and certificate. Surau Management and Administration Award went to Surau Darul Firdaus, Jalan Appollo, Sibu, taking home a cash prize of RM5,000 accompanied by a plaque, certificate and project worth RM20,000. Islamic Religious Secondary School Excellent Award was taken by SMK Agama Miri while Islamic Religious Primary School Excellent Award was awarded to Sekolah Kebangsaan Agama Datuk Haji Abdul Kadir Hassan. Both of the schools received RM5, 000 each, plaque, certificate plus gift of books worth RM3, 000. Excellent STPM Student Award was won by Abdul Ilyasa’ Bin Azman. He received RM3, 000, plaque, certificate and special aid of RM4, 000 – Tabung Ibnu Khaldun to further studies to higher learning institute. Muhamad Hafizuldin Bin Majmood won the Excellent SPM student award. He received RM2, 000; plaque, certificate and special aid of RM4, 000 from Tabung Ibnu Khaldun to further studies to institute of higher learning. Bujang Mohd Nor Maal Hijrah Special Model Award winner 0 out of 5 based on 0 ratings. 0 user reviews.